Okay, so he’s not a pony but I love him anyway. His name is Little Indian, and while part of me cringes at how that could be perceived as rather insensitive to indigenous people… I do have to say he’s adorable. 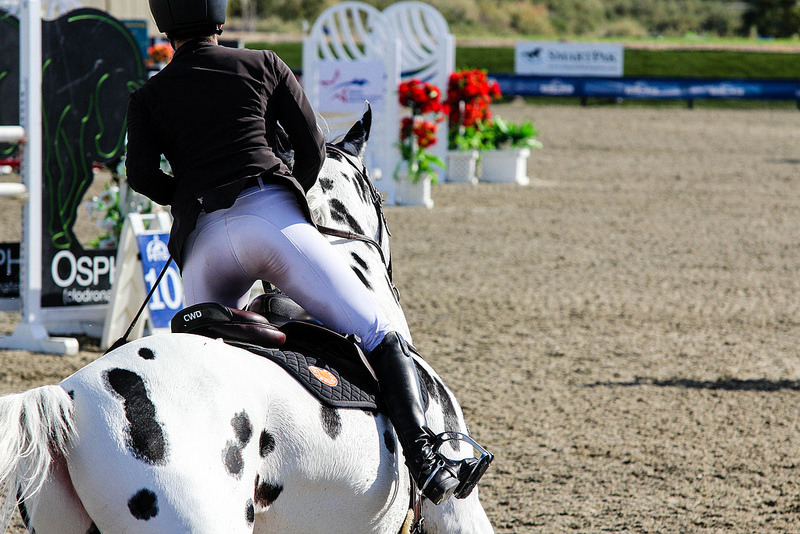 These pictures were taken at the HITS Thermal Grand Prix last weekend. 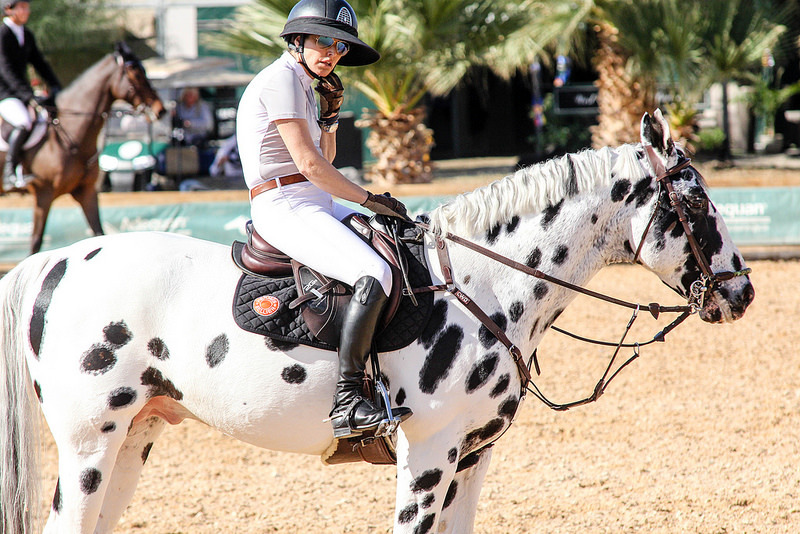 One of my friends was showing in Coachella (I am so confused if it’s Thermal or Coachella or Desert or what) last weekend, and I went out to watch her with her two fabulous horses. 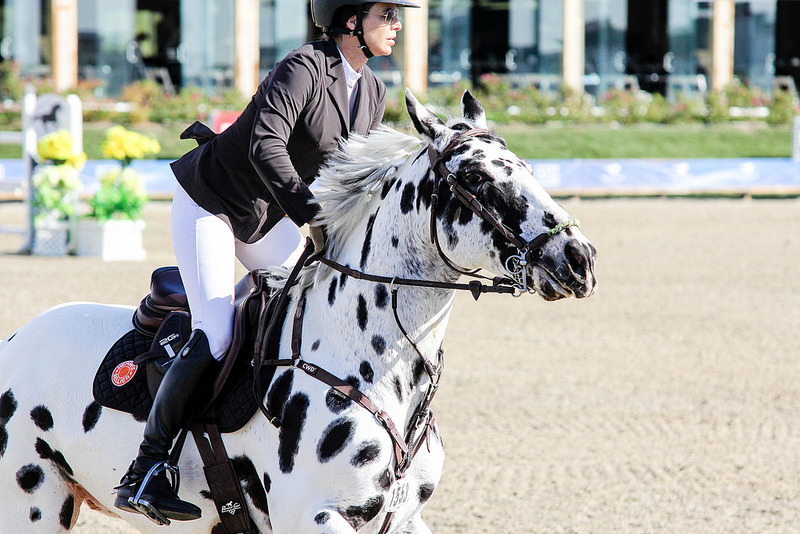 We also caught the Friday morning Grand Prix, which is where my spotty pony love made his appearance. 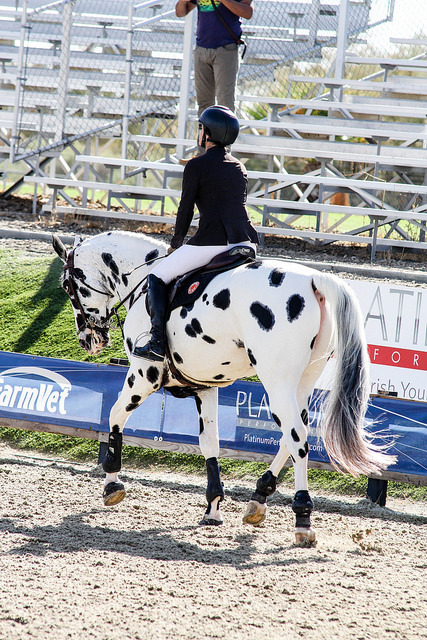 When I saw him warming up, I didn’t really believe he’d be competing in the actual class… but as thrilled when his polka-dotted fabulous self trotted into the ring. And I have to say, the thing jumps pretty cute! 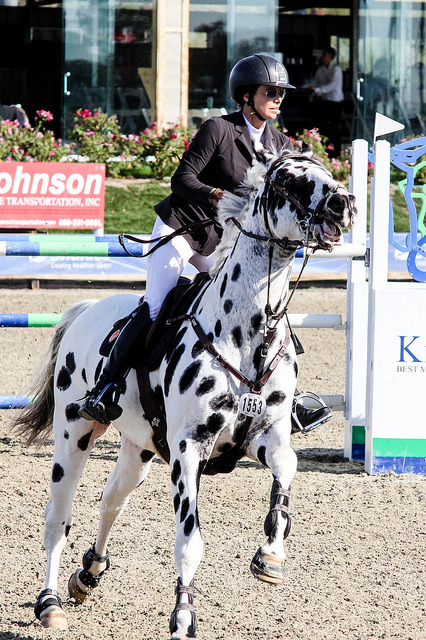 I’m usually a pinto instead of an appaloosa girl, but it’s hard to deny that leopard horses like this one are just striking. I did some googling, and he’s registered in the Anglo European Studbook. I’m not a warmblood or a breeding expert, so I’m not sure what that exactly means his breeding is. 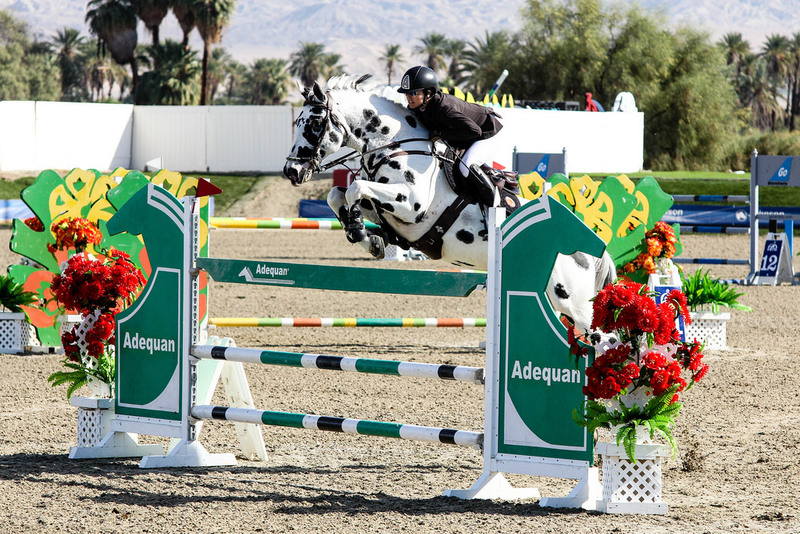 If I had to guess, it might be something like an American Warmblood… your horse can get in the studbook if it is of a certain level of quality. Breeding experts, feel free to chime in the comments and educated us. Regardless of what he’s made of, Little Indian is pretty damn cute and good at his job. I think he had one, maybe two rails down at the Grand Prix, which was fairly standard for that class. Hopefully I get to see him at other west coast horse shows in the future! Love Little Indian! also, it is HITS Coachella. They rebranded last year. People still call it Thermal though. Could be a Knabstrupper cross, maybe. 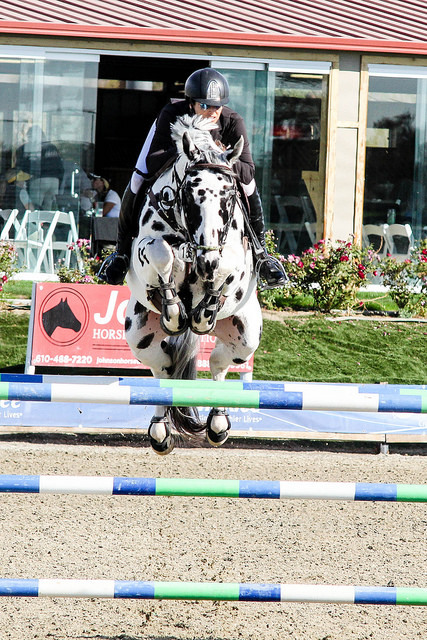 There’s a stud here in Oklahoma that stands a very nice Knapstrupper stallion (Colorado Skrødstrup, http://www.avalon-equine.com/colorado.html) who’s approved for the RPSI and sBs books. The spotty jumper is SO CUTE! I was thinking Knabstrupper in there somewhere – they’re generally big boned, too. I love leopard Apps, followed closely by blanket Apps. Appies were my favorite breed as a kid. Still love them, but you don’t see nice ones around these parts anymore. I loved the WAP lines. I will always have a soft spot for appys:) my first horse was a blue roan appoloosa and she was the coolest. Love this little guy and hope you do see more of him and take lots of pictures!!!! 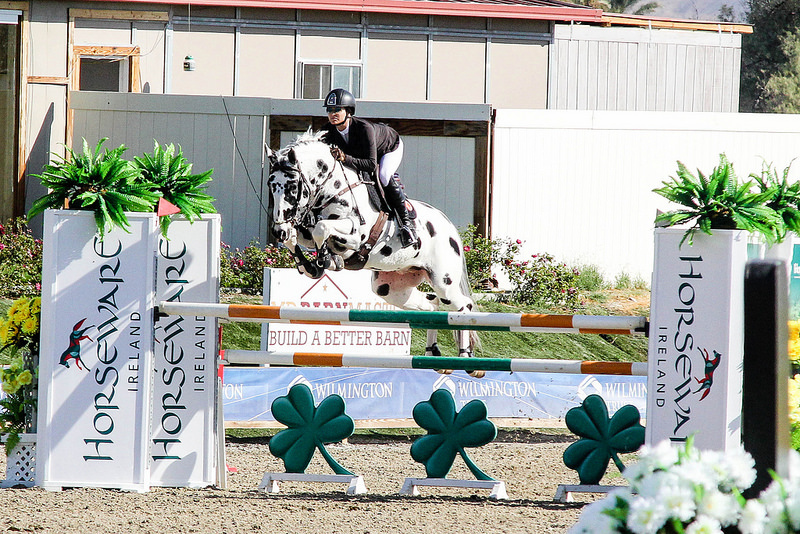 According to HorseTelex, he’s by an AES registered stallion that is SF/Westfalen/TB out of a mare that is by the pinto KWPN stallion Limbo out of a “pinto/skewbald” (which can really mean any kind of spots) Irish mare. Not surprising that he can jump! Despite the color he’s totally sportbred from mostly warmblood breeding. With all that warmblood in him, he’d sire beautiful foals with a Friesian x Appaloosa sporthorse mare. 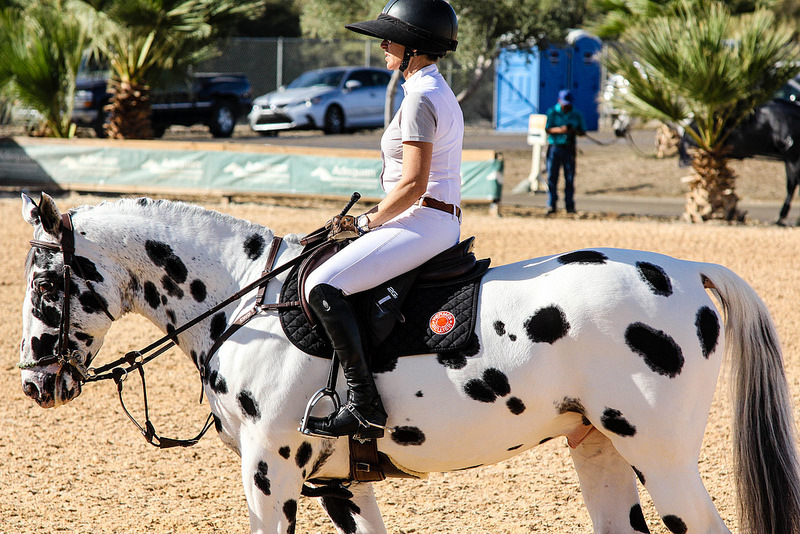 What is with spotted horses bringing out the racist names?? How cool! He looks really athletic! So flashy! 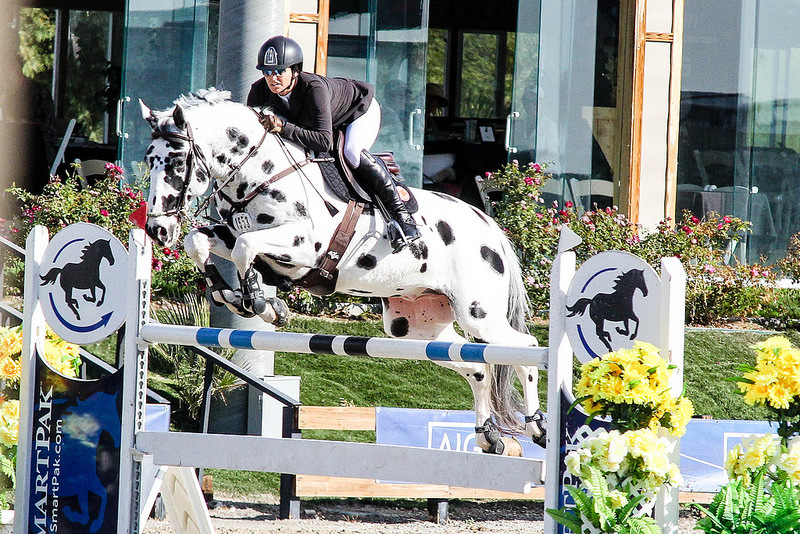 I’m not a lover of the spots for a hunter, just personal preference, but he looks right at home in the jumper ring. I always wanted a loud spotted jumper when I was younger. 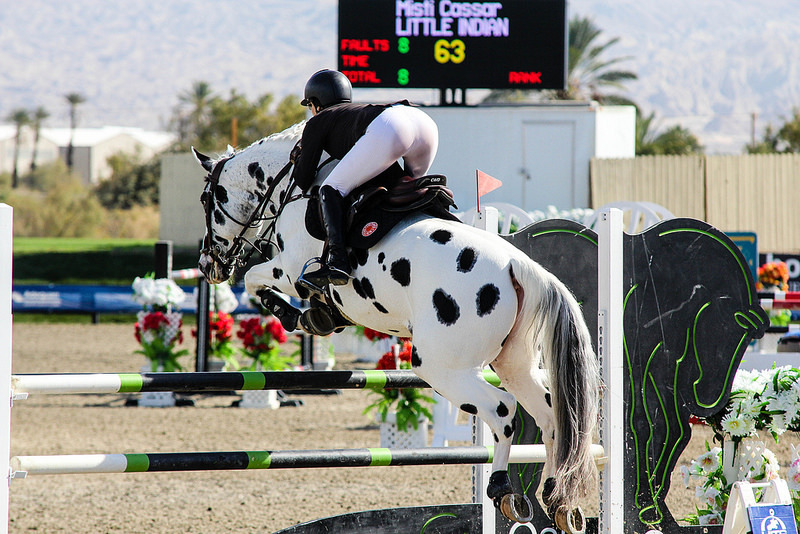 He’s such a cutie bouncing over the jumps. Boing! If you figure out the Thermal/Desert/Cochella thing, let us know. I’m befuddled. Another vote to probably has some Knabstrupper in there, they are super athletic horses with pretty spots to top it off. Last time I checked American Warmblood doesn’t allow horses with appaloosa characteristics. I really wanted to get Sydney registered as AW, but no luck. I love him. 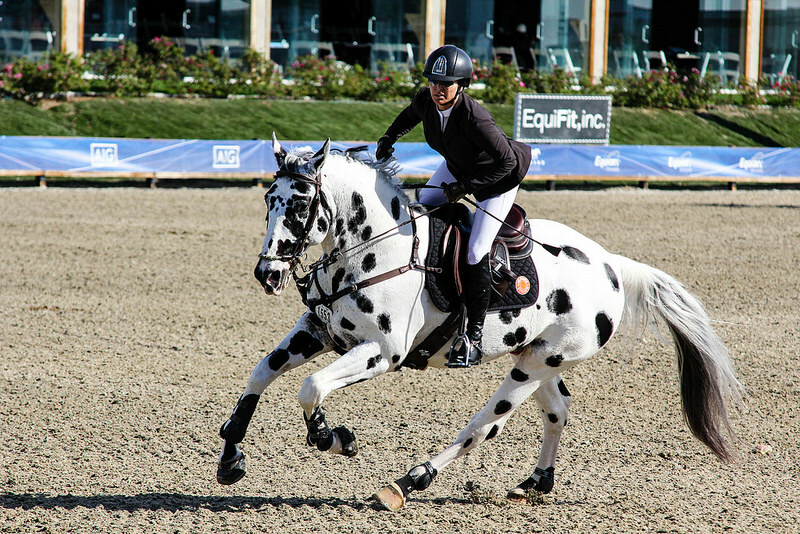 I didn’t much care for flashy ponies until I got Whiskey and now I super appreciate spotted wonders. He’s the cutest! I love different colored ponies the best! I LOVE Appys! He’s gorgeous!! Love your blog..keep it lit! !